Thanks to its search engine, subscribers to the Whitereport platform can have results for unlimited and flexible queries literally in minutes. For each of the 1100+ content and media provider companies, data queries can provide information like type of medium (television, radio, print, online etc.) based on the main revenue source of the given company, official address with postcodes, registration number, company size class (large vs SME), form of company, direct ownership, and a host of other information. You’ll also find financial and commercial data on company turnover, operational profit, tax paid after profit, profitability patterns, segmentation of turnover; net advertising revenue, distribution revenue, digital revenue etc. whenever public data are accessible. 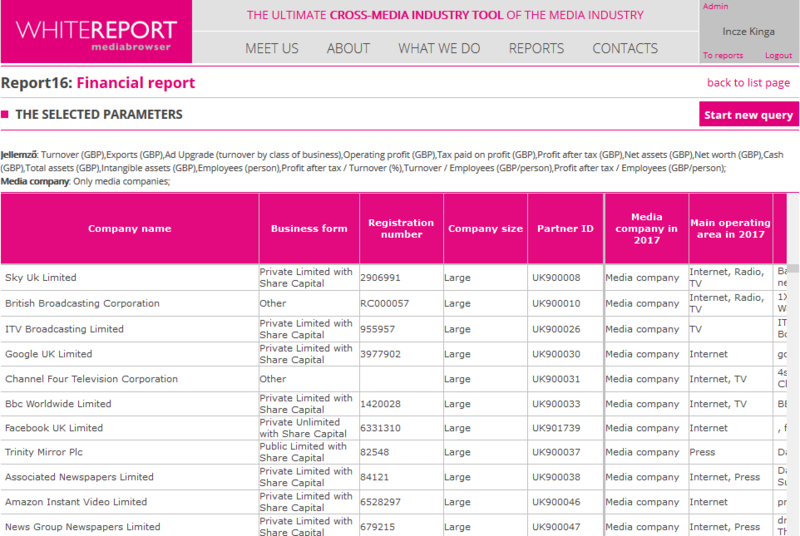 You will find company turnover data for 447, operational profit for 372, tax data for 234 UK media companies (small accounts do not have to report such information). Whitereport subscribers can also search the whole database or certain segments for many other financial data (net worth, intangible assets, etc.). We collect and store whatever content-related revenue data is available from public sources (making it possible, for instance, to separate the telecommunications and content revenues of a company such as Sky). You’ll also find ownership information on each company. The UK Financial module was launched in October 2017 with public data available up to 10 Oct 2017. We will follow up on the performance and changes of the 1168 UK media companies with an updated tranche of data in July 2018, and thereafter subscribing members will have access to data updated on a weekly basis. 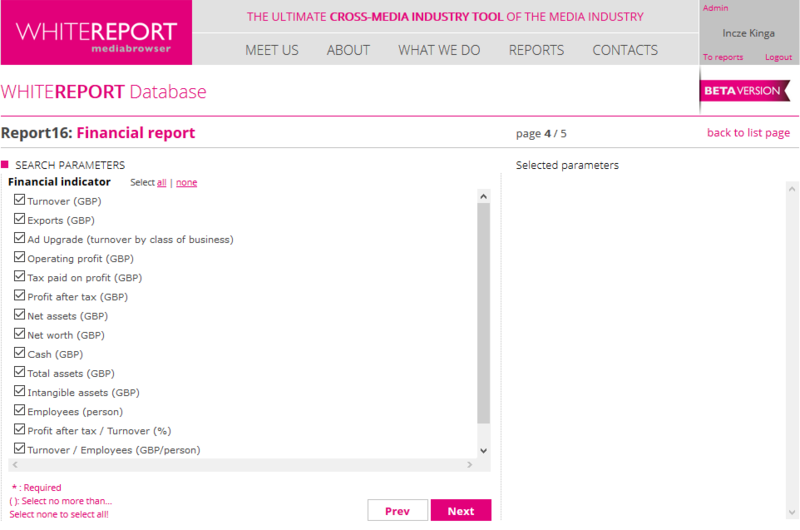 Would you analyse the 1168 UK media companies on your own, far more easily and comprehensively than ever before? Sign up for your free 14-day trial access to the Whitereport Financial Module. These 1168 companies are just the tip of the iceberg. In addition to updating the current Financial module, we will enhance the database with the Universe module to explore the longer long tail, including non-professional media service providers.  Can’t wait to analyse the 1168 UK media companies on your own, far more easily and comprehensively than ever before?